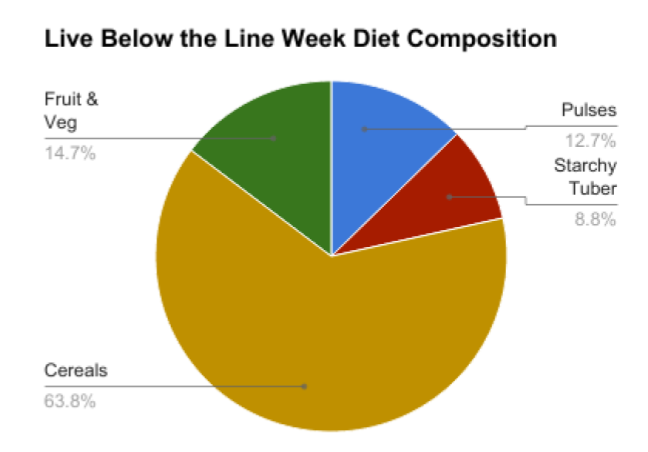 This week, participant blogger Rachel Friedman is back to share her insights about her own Live Below the Line challenge and the nutritional challenges of eating on such a diet! This week I'm eating like a peasant. Now that (or more likely, this post's title) might have rubbed you the wrong way. For some, it conjures up unpleasant images of feudalism, toiling under rich landlords; for others it may have too many associations with colonialism and hearkening to an era where rural people in developing countries were somehow seen as inferior beings. But at its root, the word means country dweller. * And most people living in poverty live in rural areas. "I'm eating like the average resident of a developing country" would have been a more accurate statement. If you look where my calories are coming from over the course of the Live Below the Line Challenge, it's quite similar - although missing the eggs, fish, and other animal products that do feature in most diets. Cereal grains (oats and rice) comprise nearly two-thirds of my daily 2000 calorie intake, and pulses are a major source of protein. Now take Asia for instance, which houses the majority of the world's poor (and population as a whole). Rice is the staple food, making up 50-66% of caloric intake in the region (with the higher values corresponding to the less economically developed countries). Pulses (e.g lentils) are also staple foods that, although usually contribute only a small fraction of calories, can actually make up close to half of protein intake. Roots and tubers (e.g. sweet potato and cassava) have historically made up nearly half of calories in many African countries, but this began falling during the Green Revolution. Now, the ubiquity of such a diet doesn't mean it's the way forward. For one, although grain-heavy diets provide enough calories, they often lack important micronutrients. Often referred to as the "hidden hunger", insufficient intake of vitamin A, iron, zinc, and folate is particularly concerning in children, who can suffer stunting and hindered brain development. While things like home gardens have been proposed as means of curbing such deficiencies, the poorest of the poor also often face difficulties getting their hands on land. Besides being a human health issue, a healthy and diverse diet is increasingly considered a human right. It is also disempowering not to have the resources to choose what to eat, when, and how much. But there are also lessons to be learned from how the majority of the world's poor about how to eat for the planet. On average people in East Asia and the Pacific consume around 1/3 the amount of meat as North Americans and Europeans, and in Sub-Saharan Africa it's about 1/8th. Eating a primarily plant-based diet is generally acknowledged to have a lower carbon and water footprint than one heavy in meat (especially beef and lamb). According to the World Resources Institute, if the world's top 2 billion consumers reduced their meat and dairy intake by 40%, we could free up land double the size of India and avoid greenhouse gas emissions three times the global amount in 2009. Furthermore in many developing countries, what animals are consumed are eaten in low enough quantities to be sustainably harvested, or domesticated ones serve multiple purposes on the land - livestock can produce milk as well as manure for crops, or fish ponds can provide fertilizer for crops and feed for livestock. At the end of the day, I think a glimpse of a poverty-line diet is taking a taste of moderation that the big consumers in the world greatly need. 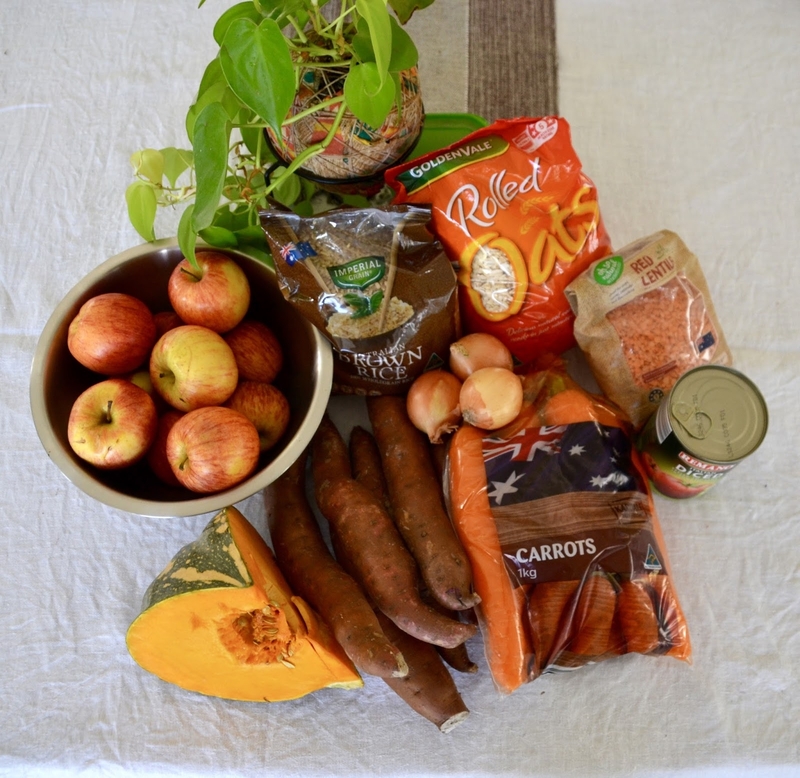 So while I miss green veggies (and chocolate), I'm pretty thankful and content with the bounty that even AU$2 per day can bring. Consider expressing your own gratitude, and sharing your good fortune by support this year's Live Below the Line campaign! Rachel is currently a PhD student at University of Queensland studying human-environment interactions in community forestry. She first took the Live Below the Line challenge while working for a US-based non-profit on food security and sustainable agriculture, and found it such a powerful and inspiring experience that she has continued in ensuing years in hopes of raising awareness and supporting important causes. In her spare time, Rachel spends as much time outside, teaches yoga, and blogs about environmental issues.